That mass of crust, sauce and molten cheese may have just blown your pizza-loving mind, but before I launch into my review, I have something very important to disclose: I'm not a deep dish pizza girl. I know it's a disgrace to my largely Chicago-based extended family, but I'll take a thin crust over a deep dish any day - and don't even get me started on stuffed pizzas! I love the crispness of a Neapolitan pie, and the bendy, trendy flexibility of a New York slice. I love the little bubbles that erupt from the wafer-thin crusts of wood fired pizza, and think that dough should be more than just a vehicle for sauce, veggies, and meat. 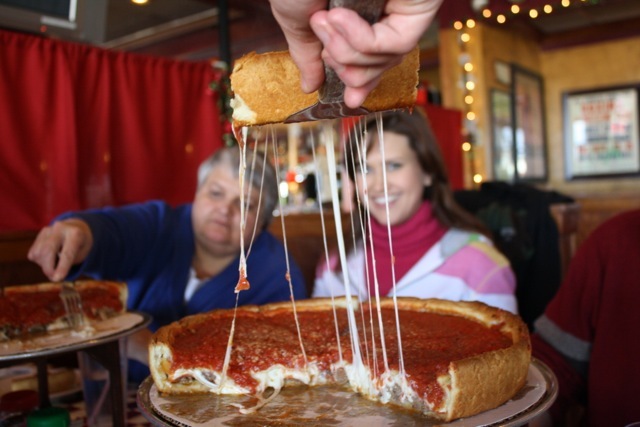 With all that in mind, you're probably wondering why I ever set foot in Giordano's, right? 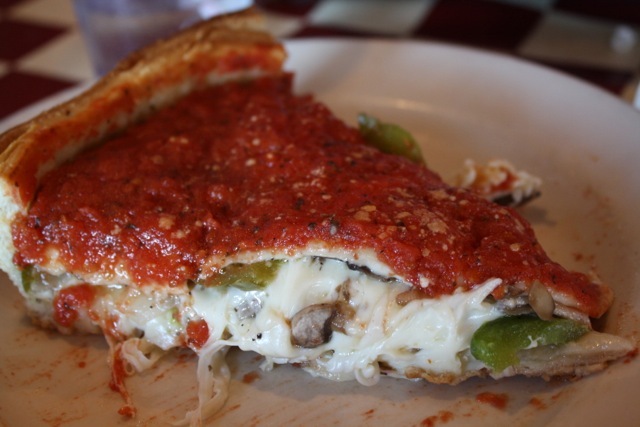 Well, apart from a serious case of 'When in Chicago...,' sometimes even the most devoted thin-crust lover just needs a bit more. And where better to get it than at Chicago's premier stuffed pizza eatery, Giordano's. Although the restaurant offers other classic staples of Italian fare, the pizza is definitely the main attraction. Unlike some of the other Chicago deep dish hotspots (I won't go into the rivalries here! 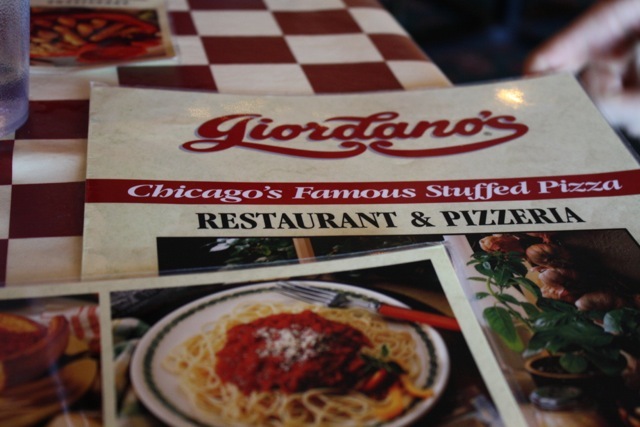 ), Giordano's specializes in stuffed pizza - not stuffed crust, stuffed pizza. Essentially, each pizza is a layer of buttery crust, suitably weighed down with the toppings of your choice, smothered with masses of molten cheese, topped with another layer of buttery crust and slathered with tangy-and-sweet tomato sauce. With this method, you can easily see why these bad boys are called pies! 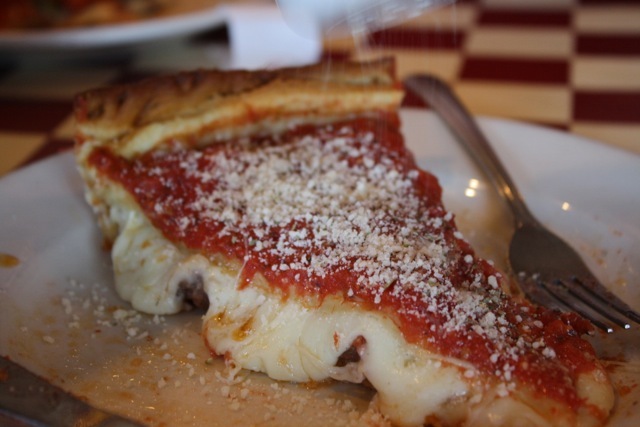 Not surprisingly, it takes 35 minutes to bake each pizza (and even then, there's always a bit of crust that's still slightly squishy - my main gripe with deep dish) so Giordano's often allows you to place your order ahead of time if there's a line. It's also beneficial to come with a plan and order quickly since their service isn't known for being particularly attentive. If you arrive during an off-mealtime, like we did, you'll have ample time to peruse the kitschy, classic Italian decor. You could also whet your appetite with an order of garlic bread (be warned that at some locations this is not made in-house), but be sure to save room for your pizza - I couldn't even manage two whole pieces and I'm a self-confessed 'good eater.' In fact, we ordered two pizzas for seven starving people and still wound up with leftovers! It's worth noting that while the pies at Giordano's may look pricey, in this case a little definitely goes a long way. Our two pies were the Special (mushrooms, green peppers, onion strings, and ground sausage as only the Italians can do it!) and a meat combo (which, I think, included pepperoni, sausage and ground beef - a little too meaty for my tastes). When the pizzas finally arrived, our server cut and served the first slice - a thick, oozing wedge framed by picture-perfect cheese strings. Look at those cheese strings! That cheese really is as fresh and delicious as it looks, but I have to admit that it bordered on dairy-overkill for me. The tangy-sweet tomato sauce helps to cut the richness a bit, but the best part of the whole pie, in my opinion, was the crust. Buttery and surprisingly flaky, the crust bakes up crisp on the edges - almost reminiscent of my beloved thin crust. The inner crusts do have a tendency to be a little soggy, but the flavor is still good. I know I've included a lot of pictures with this post, but they really just don't do the pizzas justice. I can't even begin to describe how positively massive these slices are, nor can I relate the stunning food coma into which we all slipped upon eating them. I'm not sure my stomach has ever encountered something so rich, cheesy and, well, large - I almost feel like I should have been in training, prior to our visit! 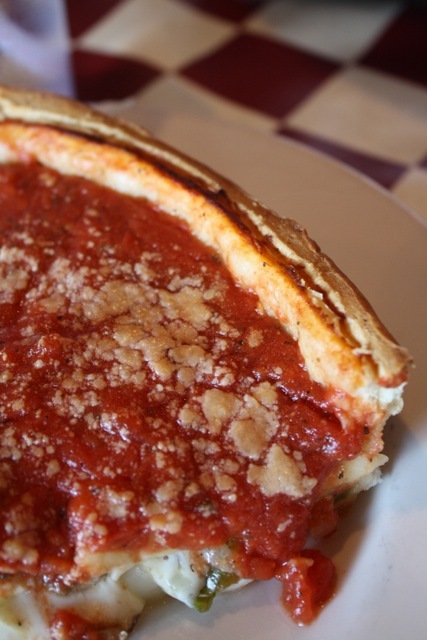 While Giordano's hasn't made me a deep-dish convert, it does turn out some pretty impressive pizzas. It consistently rates high on the list of my deep-dish loving family (I won't even tell you how many pieces Matthew managed! ), and provides a worthwhile dining experience for any visit to Chicago. I may not be trading in my pizza stone for a pizza pan any time soon, but I'm sure I'll make room for a slice or two (okay, maybe just one next time!) on my next visit. I'm a writer, a reader, a traveler and an eater and this is where all my interests intersect! Free National Parks Pass for Military Families! Copyright © 2011 TravelingSpoonBlog. Simple theme. Powered by Blogger.